Blue and Pink arrived very early and decided to play a quick game of Onirim before their food arrived. 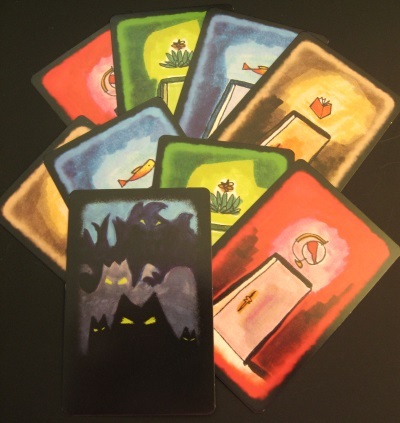 This is a cooperative, two player game with an unusual theme: players are Dreamwalkers, lost in a mysterious labyrinth – they must discover the eight oneiric doors before dreamtime runs out trapping them forever. The idea is that both players have a hand of five cards, three that are their own, and two which are shared and kept face up on the table. On their turn the players can do one of two things: play a card, discard a card. Cards are played one at a time face up in front of the player. The aim is to play a three cards of the same colour in succession, which allows the player access to the oneiric door of the corresponding colour. The important thing about the cards is that in addition to a colour suit, they also have a symbol – a sun, a moon or a key. When played, adjacent cards must not have the same symbols (regardless of colour). This is much more tricky than it sounds as sun cards are most abundant and key cards have special powers, which means you don’t want to waste them. For example, if a key card is discarded, the player triggers the prophecy which means they can look at the next five cards, discard one and return the rest in any order. Once a player has played or discarded their card, they replenish their hand with a card from the draw deck. There are seventy-six cards in the deck, including eight doors and ten nightmare cards. 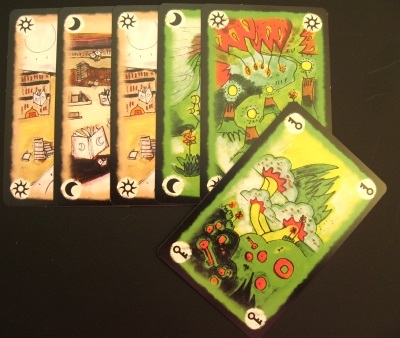 Nightmare cards are a problem, when they are drawn, players have to deal with them in some way. Players can mitigate the effects of a nightmare by discarding a key card, discarding a gained door or by discarding the whole of their hand (i.e. all five cards, including the two shared cards). If the player cannot do any of these (or chooses not to), then they must discard the next five cards. This is bad because the deck is like a ticking clock and the game ends when there are no cards left to play. Worse, nightmare (and door cards) are not truly discarded as they are returned to the deck once the five cards have been drawn, so their effect does not go away. On the plus side, if you are replacing a card and you draw a door card, if you have a key card of the same colour, you get to keep it. Like Hanabi, this is a cooperative game that can be played with a lot or a little “table talk”. Since it is quite a tough game, we decided to play with all the cards face up, but with no talking. We had just started and the game was going unusually well when food turned up. Sadly, we were very easily distracted and quickly lost focus which led to inevitable defeat as we finished just one door short. Once we’d finished eating, we gave it another go, but quickly regretted squandering our good beginning in the first game as the second game had a terrible start. Things picked up, but we still didn’t get close, finishing with six doors. We were just finishing when Grey and Cerise wandered in clutching a new game called Slavika. Slavika is a card game of heroes and monsters with really beautiful artwork. Each player is the head of a household and has two hands of cards, one of heroes and one of monsters. On their turn each player plays three cards, the first card must be a hero, the last card must be a monster and the second card can be either a hero or a monster. Each player starts with six heroes in their family and five monsters, each with a strength; although monsters are replenished once played, heroes only return when they have finished being heroic. The idea is that there are a number of regions that players are fighting to protect from the monsters. Each region is different and has a maximum number of heroes and a maximum number of monsters: when world is over-run with monsters, the battle is concluded and the combined strength of the monsters is compared with the combined strength of the heroes. If the heroes win, then the player who contributes the most to the battle (the most heroic player) wins the points and also the treasure stored on the island and the heroes fighting for that world are returned. If there is also a thief, however, then the most heroic player wins the points but the thief runs off with the treasure. If the monsters win, then nobody wins anything, the monsters leave, the heroes return home and another treasure card is added to the region and the fighting begins again. Blue had no idea what was going on, and Pink was not much wiser, but after a couple of rounds they got the hang of it a little and everyone realised that if people insisted on thinking before playing cards, it was going to take way longer than the stated thirty minutes! By this time, Red, Yellow and Orange had also arrived and had riffled through the bags and chosen …Aber Bitter Mit Sahne (aka Piece o’ Cake). This is a cute little set collecting game that we first played a few weeks back. 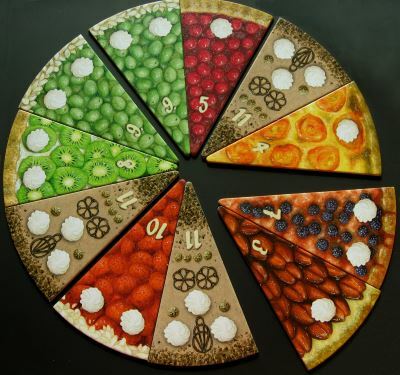 The idea is that one player divides the cake and then the others choose which slice to take and how much of it to eat. Points are scored at the end of the game for the player with the most of each type of cake and for the number of “blobs” of cream on cake that has been eaten. In case of a draw, all parties win the pints, but no points are scored for sets that aren’t the largest. Thus, the player dividing needs to try to make sure that they are left with something useful after everyone else has chosen, but at the same time, they don’t want to give away anything too enticing. Similarly, players choosing have to be careful to take something that is useful, and keep something they think they can build a large set of while maximising the number of blobs of cream they eat. Red ran away with the first game, but the second was much closer and came right down to the wire with Orange just beating Red by two points. Meanwhile, Blue, Pink, Grey and Cerise were still playing Slavika, so Red, Yellow and Orange decided to give Tsuro a try. This is a bit of an old favourite as it is fairly quick, plays up to eight, is very easy to teach, and has a nice healthy dose of tension. In summary, players start with a hand of three tiles each depicting track and a stone on the edge of the board. On their turn, the active player plays one tile in their chosen orientation and then moves their stone along the track. Players must try to stay on the board unless they have no choice and if two stones collide both players are out. Hands are replenished until there are no tiles left, and when people are knocked out, they redistribute their tiles amongst the remaining players. Last player on the board wins. With only three players, it was slow to get going, but before long Yellow and Orange had fallen off the board leaving Red to take her second win of the evening. Just as Red was finishing off her competitors, Pink was trying to use his thief to steal two treasure cards only to find that they were both “moon” cards. As two moon cards had already been found, that finally brought Slavika to a very abrupt end with Cerise the clear winner. This left time for another quick game of Tsuro, this time with all seven players joining in. With Pink’s help, Blue managed to run out of space after just a few turns and spent the rest of the game egging Orange into pushing Red off the board. Before long Cerise, Yellow and Red had all joined Blue spectating and the game was hanging in the balance with it unclear whether Grey, Pink and Orange would come out on top. Unfortunately for them, neither Grey nor Orange had useful tiles and Pink ran out the clear winner. The evening finished as it began with just Blue and Pink. Tempted though they were to have another go a finding the oneiric doors, they decided instead to play the “Feature Game”, Harbour. This is a recent successful KickStarter project and is a neat little worker placement game with a market manipulation twist. The idea is that each player has a single worker and can place them on one of the central buildings or a building owned by one of the players (at a cost if it is not their own). Each building enables players to buy goods or exchange goods they already have for other goods. Alternatively, some buildings allow players to sell goods and buy a building, and this is where the dynamic market comes in. There are four types of merchandise, and each has a value, but each can only be sold if a minimum quantity is reached. For example, players may get $5 for shipping fish, but they must have a minimum of five fish in order to be able to sell them. Meanwhile, wood may only yield $2, but players will only need two in order to be able to sell. When someone sells something in the market, demand changes the values at market, with the values of unsold goods increasing and the value of items just sold dropping. Each player can store a maximum of six of each item, and unless they have a building that allows them to store goods when selling, if they sell, they must sell everything. Thus, the game is all about timing and selling goods before other players and when the price is right. The game ends when one player has built four buildings, leaving the other players with one final turn. Blue and Pink had played the game once before and Pink was of the opinion that the person who managed to build four buildings first would win. Blue was less convinced as she felt that that player could get once less turn and that would allow other players to buy more valuable buildings. This wasn’t an opportunity to test these theories, however, as Blue quickly bought three high value buildings and Pink’s less profitable buildings were sufficiently undervalued to ensure that Blue’s commanding lead was insurmountable. It is definitely an interesting little game though and will get another outing soon. Learning Outcome: Don’t get distracted by food. This entry was posted in Games Night and tagged …Aber Bitte Mit Sahne, Hanabi, Harbour, Onirim, Slavika, Tsuro on April 12, 2015 by nannyGOAT.